This article will cover the converting of a static web site design into WordPress without, as the title says, lifting heavy loads. Is it possible? Well yes, if you’ve got the moves, the tools and know what you’re doing and you have Branko, Ivan and Tomislav at your side to help when you get stuck in that coding jungle :p.
This article is targeting wordpress users that are comfortable with HTML&CSS and have a need to convert their static sites into a dynamic CMS. 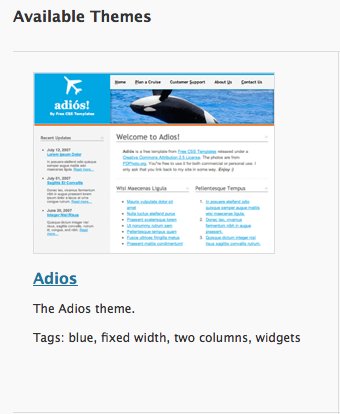 We’ll call our wordpress wannabe site “Adios” and you can use the these files to follow along. The theme was of course found on Smashingmagazine and it’s valid from top to bottom. What’s inside a theme folder? 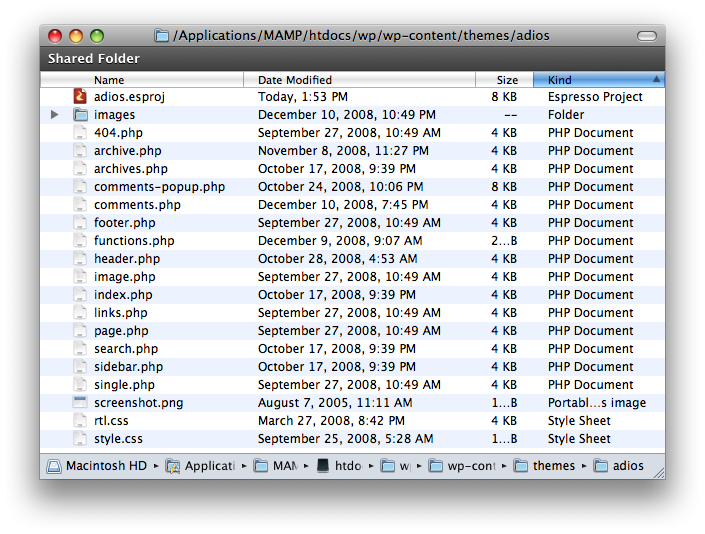 Note: that first file is not a part of WordPress, it belongs to “Espresso” application I’m using so ignore it. (Not the application of course just the file). index.php – The main file. 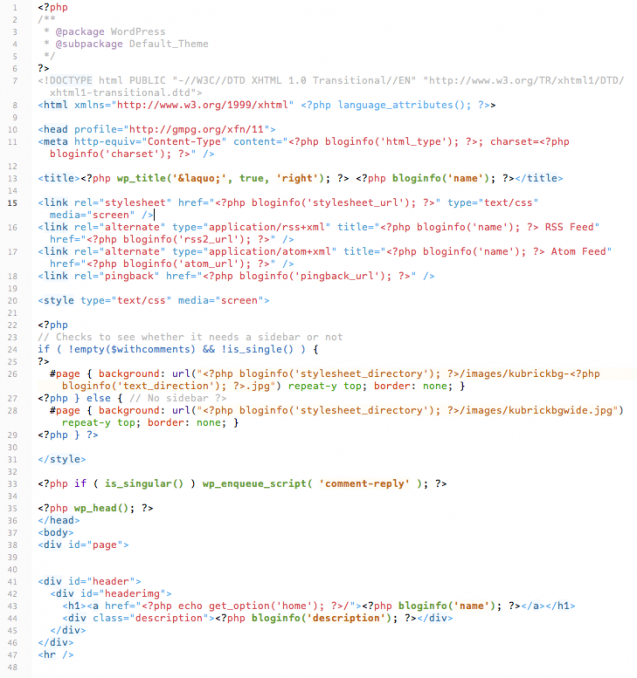 If your theme provides its own templates, index.php is a must. style.css – It’s the main stylesheet for our theme. This of course is obligatory too. 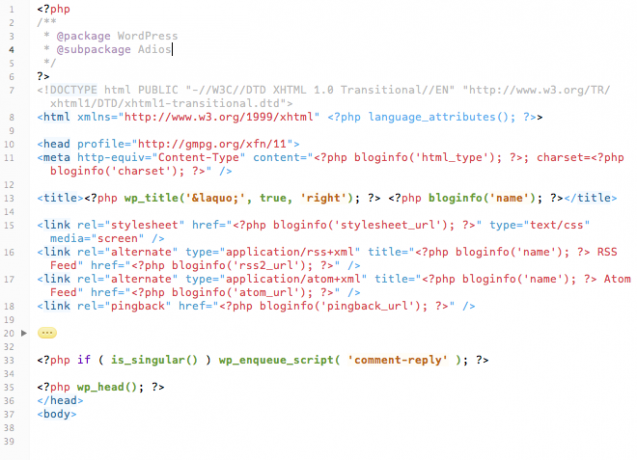 comments.php – You’ve guessed it, this one displays comments and it overrides the wp-comments.php. page.php – The one you’re looking for, the one that turns wordpress into a CMS and you can have them as many as you like. We’ll cover that too. Also belongs to the query templates. category.php – Displays post categories. Used when a category is queried. archive.php – The archive template. Used when a category, author, or date is queried. Note that this template will be overridden by category.php, author.php, and date.php for their respective query types. search.php – The search template. Used when a search is performed. 404.php – The 404 Not Found template. Used when WordPress cannot find a post that matches the query. Before we start assembling our site inside the wordpress, it’s extremely important to change the following in the theme’s stylesheet (style.css) and to create a screenshot of that theme. If you miss that part of the theme development, wordpress will hunt you down:) Actually it simply will not recognize your theme. After you’ve changed the info above, take a screenshot of your static site and resize it nicely to 240 x 180 px and then overwrite the screenshot.jpg in your theme’s folder. 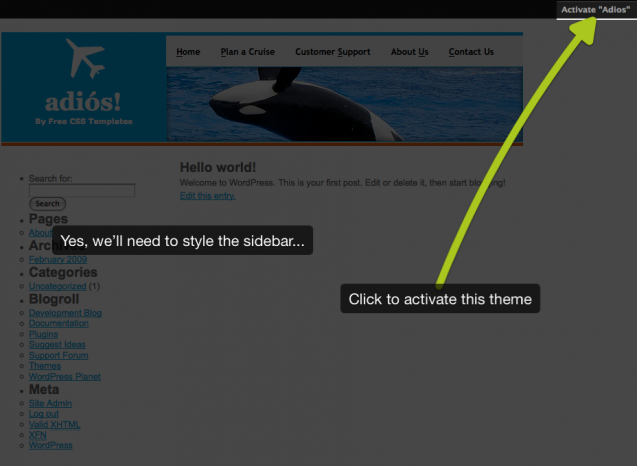 This image will represent your theme in the backend alongside the info you’ve entered in the “style.css“. Stefan Vervoort wrote a very useful article called “WordPress Theme Development Checklist” so check it out. That’s it. Now we can move on to the step 2. Decide which part of the page will be placed inside the header.php and footer.php as these will be are main files included into every page/post. Then we have the “#footer” which we’ll put inside the “footer.php” with the closing body tag. The middle part, the “#page” will be put inside the “page.php“, “index.php” or “home.php” since it includes the “header.php” and “footer.php” thus rendering the whole page in the browser. We’ll do that after we finish the “header.php” and “footer.php“. What now? You can now open the header.php and footer.php from our newly created theme folder and have a look inside. 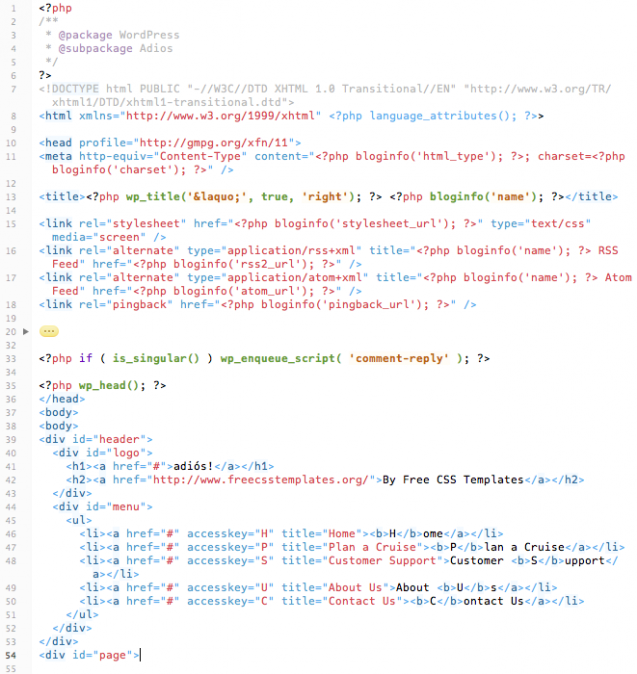 We’ll remove some of the code in both files before we “paste” ours while leaving most of the wordpress code. 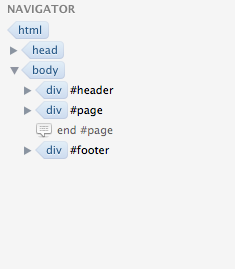 Now we can put our code in the “header.php” immediately before the beginning of the body tag. Which part of the code? The one that will repeat on every page, blog post etc. Now, will put the code inside the “footer.php” which will close the body and page tag which wraps all of the code. 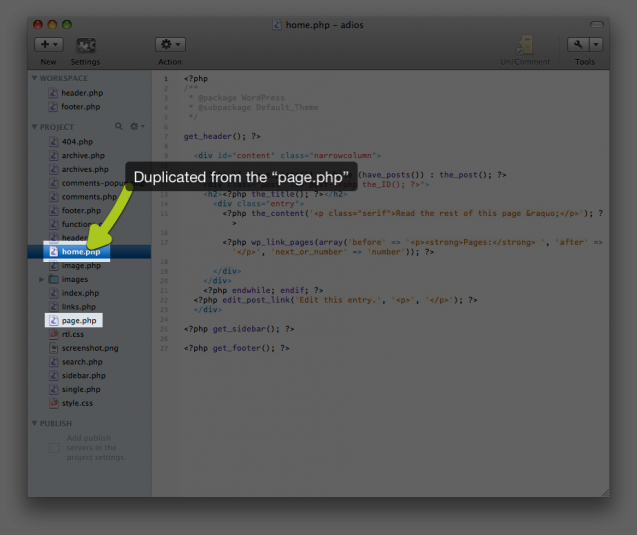 The next thing we need to do is to create a “home .php” file by duplicating the “page.php” file and customize the code there. Now that we’ve assembled our front page html structure and integrated the wp functionality, what’s left is to place all the images from our HTML template into themes images folder and insert the css code into the style.css minding the paths to the images. All we need to do now is to set WordPress to display our page instead of the blog posts. I don’t normally publish but I enjoyed your blog a great deal. Very nice blog. I totally agree with your thoughts. 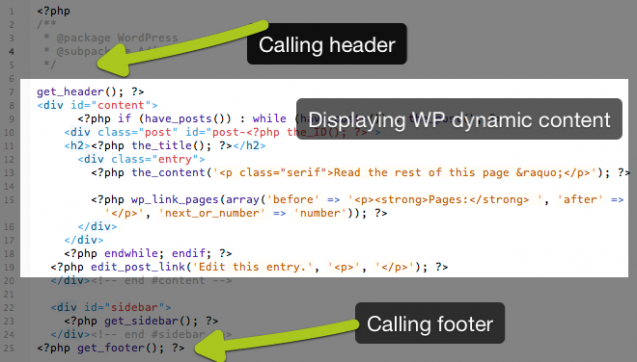 Great introduction to WordPress Theme development. Thank you!